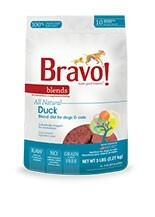 Intended for intermittent or supplemental feeding only. Consider adding your choice of supplements for a complete and balanced canine diet. Duck, duck bone, duck liver, duck gizzard, duck heart, green beans, squash, broccoli.